Meet Jennifer and Mike. They had one of the most interesting combinations of venues for their beautiful fall wedding. The lucky couple is from Chicago, and chose Nashville for their very special destination wedding. The ceremony was held downtown at the beautiful Cathedral of the Incarnation. This is one of the most palatial churches in Nashville, and provided the perfect backdrop for their full-length, traditional Catholic ceremony. After the ceremony was over, the couple and their (quite large) bridal party were whisked away by a 50-person limousine, where we made stops at Riverfront park where Mike's friend had driven his boat down from Chicago, where staged some fun, bridal party portraits. After this, the party moved over to Mt. Juliet at Terian Farms. This is a quaint, working horse farm. Jennifer was even brave enough to get up close with one of the horses for some tremendous party shots. I meet regularly with brides (and grooms) to be and the most common comment I hear is "This is the first time we've done this." This is usually followed up by an hour of machine-gun-style tips and suggestions (from me) but I realize that sometimes it's a lot to take in and digest. I'd like to use this blog to share those ideas and concepts and hopefully help you to make the right decisions on how to structure YOUR special day. There simply is no substitute for proper planning. The diligence you do here will pay off in a smoothly-run event but even more importantly, it will pay off in putting your mind at ease and to understand better what to expect. It's always best to write out a Timeline of Events for your wedding and it's almost always a good idea to employ someone you can trust to help you in this process, ideally someone who has experience with this. Now keep in mind, a Timeline of Events is a game plan. It's quite likely that your event will not follow the script exactly but that written timeline will give your vendors a clearer picture of how you want things to go and it will also give you peace of mind that all the details are taken care of, letting you actually enjoy the evening instead of worrying about it. The moment your guests walk into your Wedding Reception is perhaps the most crucial of the entire evening. They should be greeted by soft (dimmed) lighting and quiet, beautiful music. This is also where uplighting comes into play. The goal is that you want them to pause in the doorway and tilt their heads back in order to take it all in. We call it the "tilt back effect". Anytime we see this, I know we're off to a good start. The second strong start you want is the Grand Entrance, or the introduction of the Bridal Party. This is THE moment of your arrival. Even if you're the shy type who doesn't want to be the center of attention, understand that this evening is also about your guests. A great Grand Entrance is another great way to set the tone and raise the expectations of your guests. When you raise the energy level here, it pays off throughout the evening. Finally, make sure you have a strong, and definite exit. Without a definite exit, guests end up "sneaking out" and that dampens their perception of your event and how great it was. 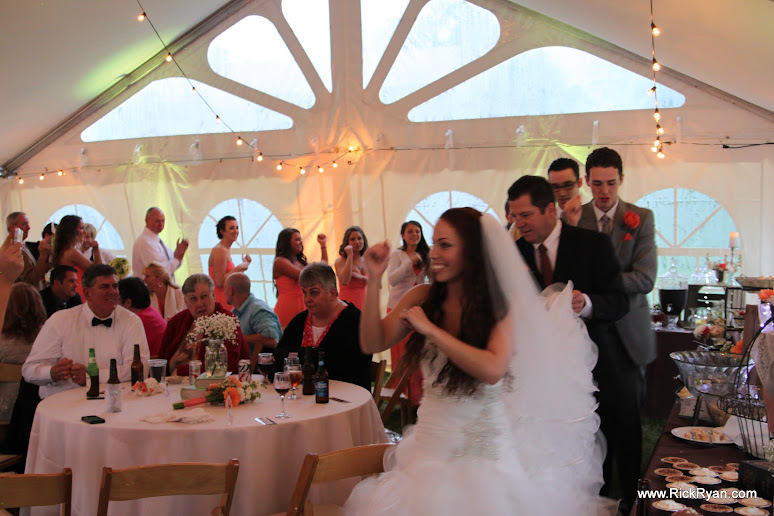 Most wedding receptions follow the same general format but I see a wide variety in how the special events are handled. One of the biggest mistakes I see made is when things like First Dance, Parent Dances and Cake are stacked up, back-to-back. The comment usually is "We're going to get those out of the way." BIG mistake. These special events are traditional elements of any good wedding celebration and we term those "Room Focus Events". We recommend that you spread RFEs throughout the evening. It's always best to spread these events at 20-30 minute intervals, throughout the evening. First, it keeps your guests entertained but it also works to re-center the group's attention and holding their attention will pay off in holding them longer at the event itself. Your Wedding Reception is a huge event in the life of a young lady. You plan and plan and plan and every detail must be perfect and especially so if you're a micro-manager type. No matter how detailed your plans may be, you must keep in mind that your event involves people and the one constant about dealing with people is that there are no constants. 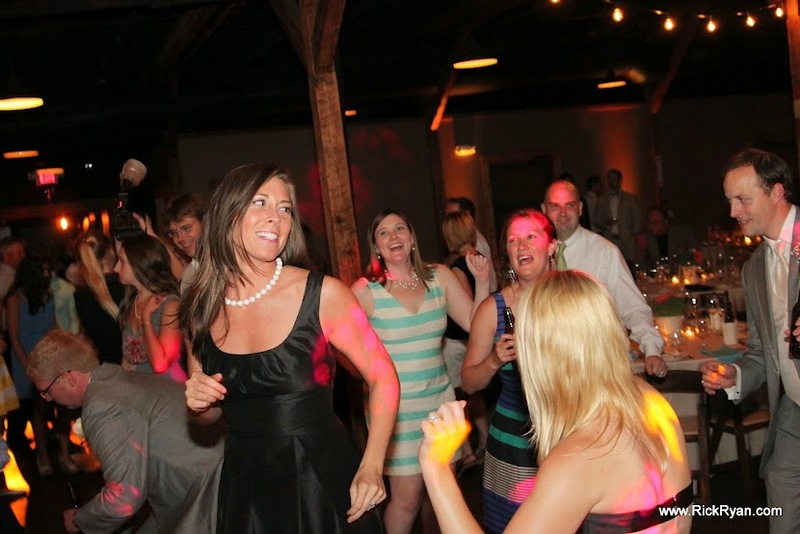 Each Wedding Reception is different and has its own ebb and flow of energy and this just isn't something you control. You have to let it unfold, naturally. Do your diligence and planning up-front but when it comes to the day-of, sit back and take it all in. Don't let some small, un-planned event take away your joy and ruin your memories. I trust that you find something in this blog that will be helpful in planning for your own special day. Enjoy it all. Would you like more info on our services and how we can benefit your event? 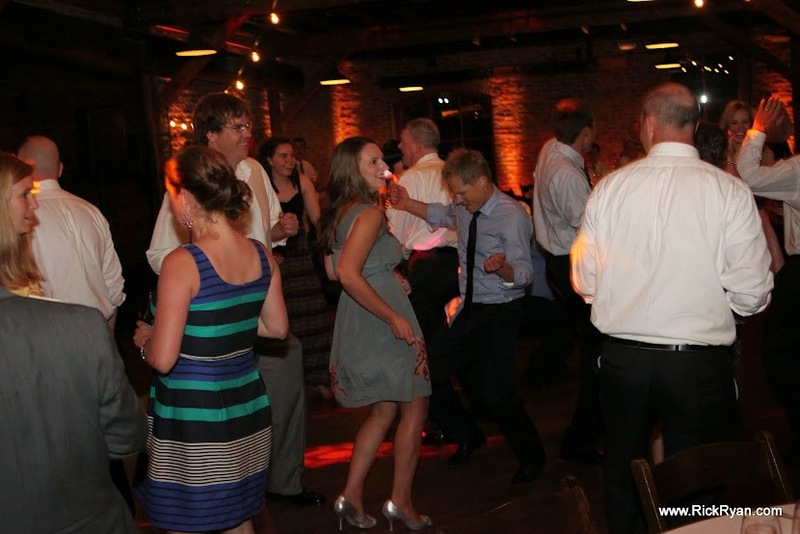 Rick Ryan Entertainment is Nashville’s premiere party entertainment service. 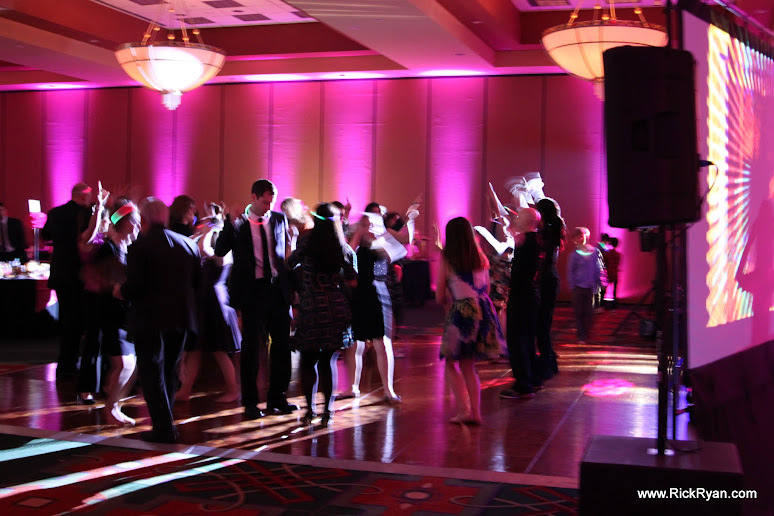 Our team of DJs and support personnel provide the ultimate in DJ, Emcee, Lighting and PhotoCenter service for many of the area’s most discerning clients. We would be honored to be part of your very special occasion. Meet one of the sweetest couples in the world, Doris and Oscar. This lovely couple tied the knot at the world-famous, Opryland Hotel. We were honored to provide DJ/Emcee, Live-Pics/Texting and Photobooth for their event. For those who have been there, you know that Opryland is one of the most premium venues in the Nashville market and the Magnolia ballroom is simply stunning with its very ornate columns, mirrors and carved trim work. After exchanging vows, our couple and their guests joined us in the atrium for cocktails. It didn't take long to start having some fun with the Photobooth. After the formalities were finished it was time for open-dance. Our lucky couple certainly managed to dance the night away. We'd like to also extend a special shout-out to Courtney Hammons and her wonderful staff at A Magical Affair, who provided planning and direction for the event. We wish both Oscar and Doris all the very best in the world and especially in their next great adventures in Belgium! Color choice is key to making any lighting work and it also displays your personality, perhaps more than any other decor decision. In choosing a lighting color (or colors), we often see one of the most common mistakes; using a color that is too sub-dued. 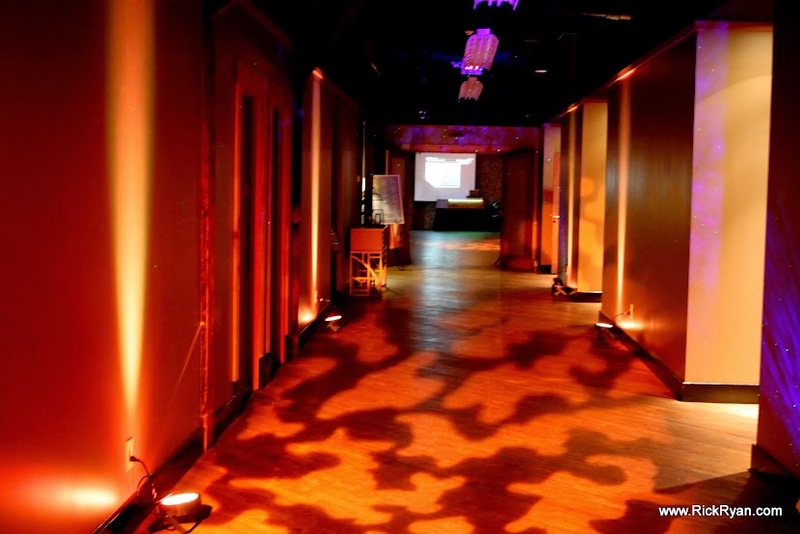 When used correctly, uplighting should make your room "come alive" and we always tend to lean towards more vivid colors. First, a vivid color is more eye-catching to your guests and it can't be stressed enough how important it is to overwhelm your guests' senses. 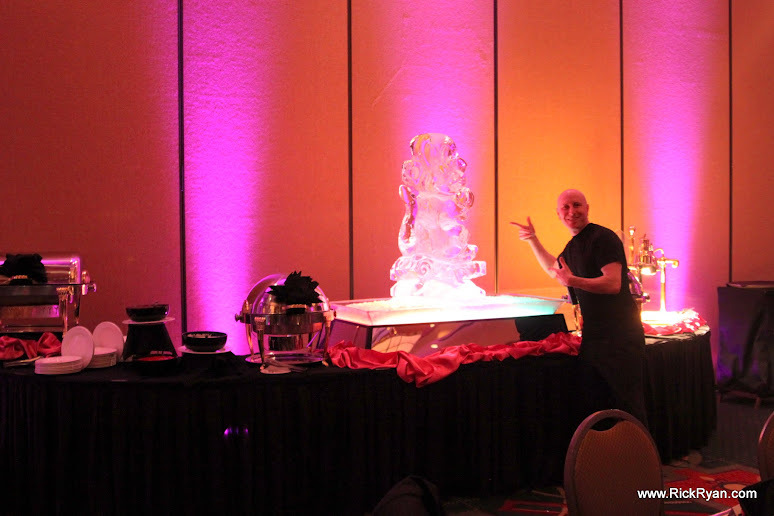 This first impression is absolutely key in setting the proper tone and ambiance for your event. Second, vivid colors work to increase the depth-of-field for your photography and videography. In selecting a color(s), we generally recommend the following: Magenta (bright purple), Royal Blue, or Amber (yellow-white, with just a hint of orange), Pink (for the girly-girl in you) or Red (especially for the holiday season). Keep in mind, it's not a necessity to try and match your table colors exactly, especially when using something like Silver or Gray. Go for a lighting color that works WITH your table colors. It's also highly-advisable to stay away from darkness-based colors (maroon, dark-blue, hunter-green, etc.). These colors are based on an absence of light (darkness), which means your fixtures will be putting out less light, not more. Christmas lights and little 7-watt (1-foot spacing) bulbs just don't give the same effect. It's also highly advisable to make sure that whatever ambient lighting you use, it can be dimmed. For our events, we generally have ambient at 50% brightness for the guests' arrival (to maximize uplighting effect), then push it to 75% for dinner (so they can see to eat), then finally we'll dim it down to 30% for the dance portion. 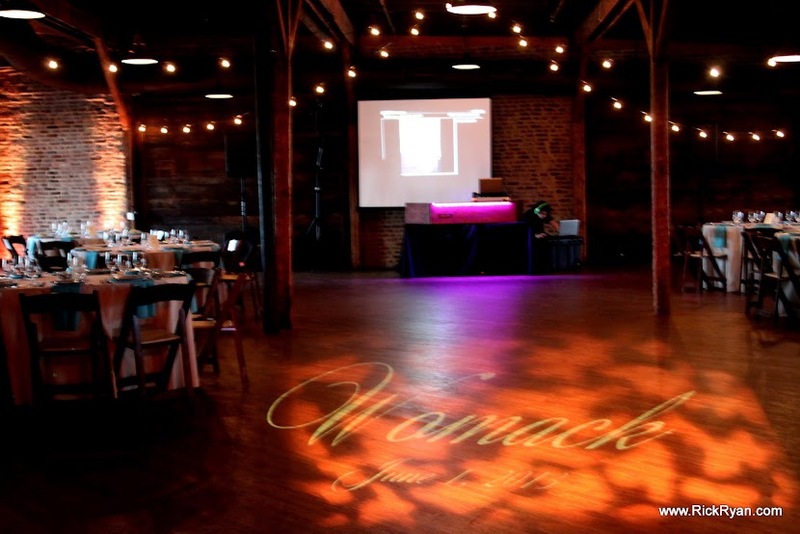 If you're using perimeter uplighting at your event, make sure you discuss table placement with your venue or planner (whoever is responsible for the floor diagram) that you are doing perimeter lighting. The biggest problem we run into is when the venue doesn't know about uplighting and they push tables, right up against the wall. This often ends up with guest chairs that are bumping into lighting fixtures, which are sitting on the floor and shining up. End result, fixtures get bumped and the nice, uniform wall color patterns get broken up. We recommend at least 36" spacing between wall and table, to allow the fixtures to be placed without having them knocked over by guests. In addition to guest table placement, also be aware of wall table placement. Many times, rectangular tables are placed against the wall for buffets, candy tables, gift tables, etc. If you stack these tables end-to-end, it can cause a break in the color patterns. For best results, we usually recommend no more than a single 8-foot table without having a spacer. I trust that you'll find the above info helpful. If you have any questions regarding the info provided, please feel free to drop us a line (Contact Us). For other useful event photos and ideas, please also see our event photo page. We're always glad to help. Meet Jordan & Andree. Two of the nicest people you'd ever have the pleasure of meeting. This was our first time to do an event at Liberty Park in Clarksville and what a gorgeous facility this is. Three of the walls are glass and overlook the rest of the park, complete with some of the nicest scenery you can imagine. With the reception beginning during the day, lighting was completely by sunlight. Given this was our first time at this venue, we had a special challenge in that we had to "fly blind" on the lighting. The other challenge was that the walls were a fairly dark color, which makes it even harder to color match, much less to do it in full sunlight. However, Matthew was certainly up to the challenge and nailed a gorgeous color that we used around the building's perimeter. 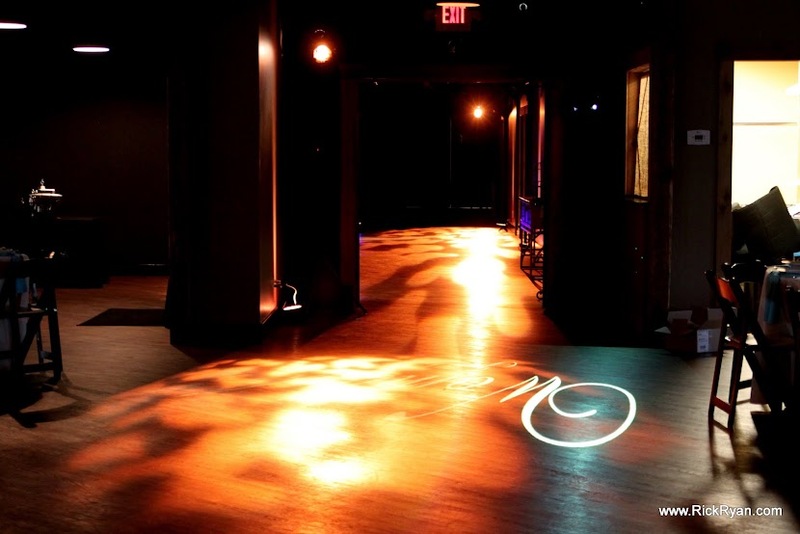 For the dance floor, we used 2 Leko lights (theater lighting) to spray gobo patterns onto the dance floor. In the center, we placed the couple's monogram. The results were very good. As the evening progressed, the dance floor heated up with our couple and guests dancing the night away to a lot of "old school" material. By the end of the evening we also had another special treat. As it turns out, we're also booked to do Lindsey's wedding in March, 2014. 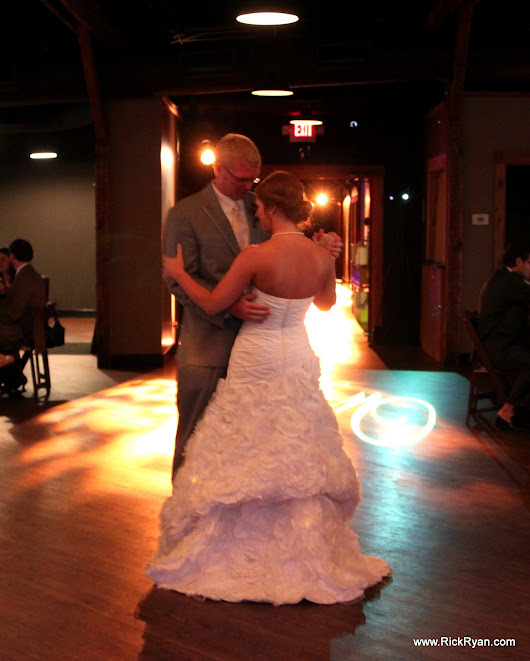 Both Lindsey and her fiance were in the bridal party for Jordan and Andree's wedding. We'd like to say a huge "Thank You!" to both Jordan and Andree, for allowing us to be a part of your very special day. We wish you both many happy years together and wish you all the best. Event Pacing - The key to the "Magic"
I have to admit it always tickles me to hear the sales pitch of DJs who proclaim about how it's their "sparkling personality" or "mic skills" that make an evening special for their guests. Sorry, I beg to differ. Perhaps I'm a bit of a simpleton (an under-statement) but I believe a great event is designed and executed. It does not just "happen magically", at least on a consistent basis. Sure, there are a million little tid-bits of tricks and stunts we pull to control, influence and steer but at the end of the evening, the event pace is what makes it all come together. The first goal we have is to build a good timeline of events. Grand Entrance, Dinner, First Dance, etc. Now I know that some DJs are strict "by the schedule" guys/gals but with our crews, we use the timeline as a "game plan" and that game plan revolves around (in the case of Weddings) the Bride, and to a lesser part, the Groom. Before each event change, we check in with the Bride/Groom and see if they're ready. If not, do a time shift. If they are, notify the other vendors (to give them time to get in place), and do it. For our timeline builder, we use a custom-designed, web-based system to get timeline events from the client. Everything is online, centralized, and in the case of an emergency, anyone else in the organization can step in and execute the program, exactly as our client requested it. Once the timeline is built (with a phone consult the last week to go over details), we get into the meat of how to put it all together. I remember from my musician days at The Grand Ole Opry where several artists told me, "Rick, always give them something different". We use that concept today in how we time and run our events. It seems to work. The most basic rule is "No segment longer than 20-30 minutes maximum" (possible exception of dinner). We humans are funny creatures with short attention spans that must be constantly prodded and re-directed. Run anything too long, it's boring. Run it too short, it's piece-meal. This is also an argument to not just stack things together (First dance, parent dances, cake) to "get them out of the way". No, put each element into its own time frame and use that to re-focus and re-center your room's attention at every turn. The other element of a well-run event is patience. You have to realize, the event's energy has an ebb and flow, much like waves crashing on the shoreline at the beach. I've seen so many Brides worry themselves silly because their floor wasn't slammed in the first 15 minutes. Slow down, be patient. This is the time where we're testing the waters and gauging reactions from your guests. You'll see a lot of musical change-ups (remember our "Rule of Rotating Fours") and a good DJ is sitting there, silently, behind the console, and carefully observing, planning for when and how he's going to "drop the hammer" and kick it into overdrive. Remember, you want to start strong, and finish strong. While some DJs like to claim "I'm the party starter", most parties are going to start on their own and if the guy on the mic tries to push it prematurely, it usually annoys the guests more than entertains them. Another thing that often can trip up a successful evening falls squarely at the feet of Mr. Steve Jobs and a little device called an iPod. Let's face it, we've all got a million songs and it makes everyone think they're a DJ who can easily write out a slamming mix that will have the house jumping. I have to admit that I cringe anytime I get that dreaded 60-song playlist (yes, we'll do it, if that's what you want) where the client has picked out every single song, and in the order they want them played. Big, BIG mistake. 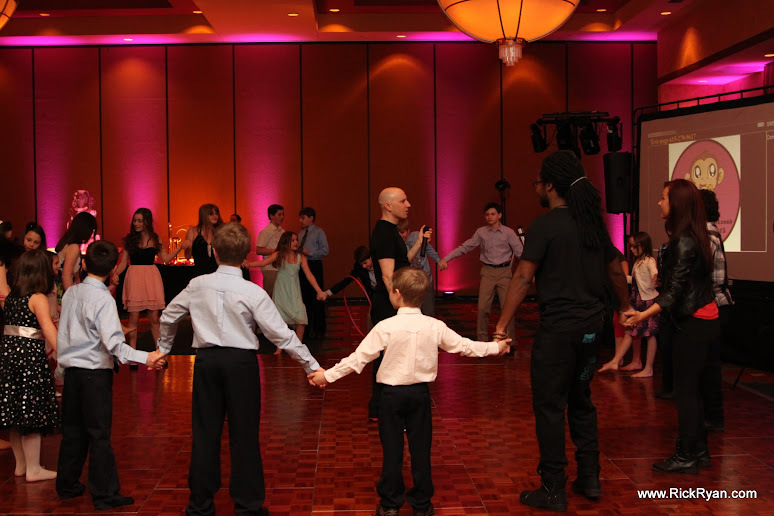 The smartest advice I can give is to give your DJ about 10-15 of your personal favorites. A good DJ can take that list and can tell within a few seconds where you are (musically-speaking) and will know how to angle the evening to make it work for you. Let the professional you've hired do what you've paid them to do. They have a method and a plan, you just enjoy the evening because I assure you it will go by quickly. I hope you find something helpful above. Setting the tone and controlling the pace, not too fast and not too slow, works and it works consistently (alcohol or not). I wish you well in planning your very special day. 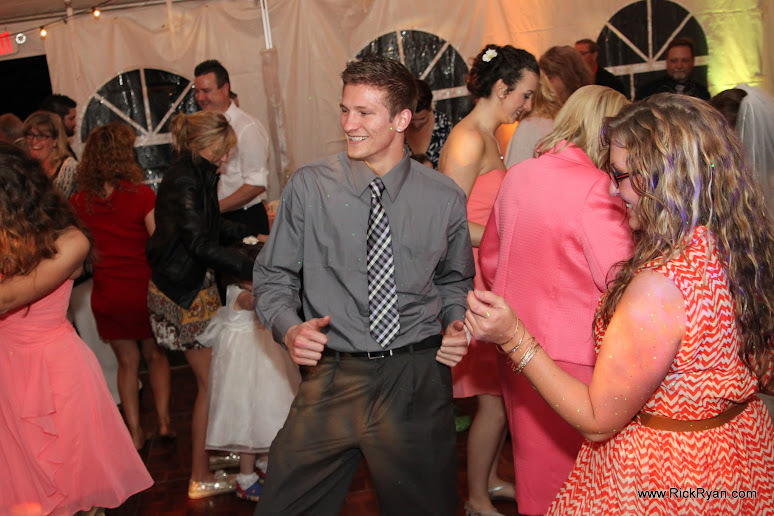 Rick Ryan Entertainment is Nashville’s premiere party entertainment service. 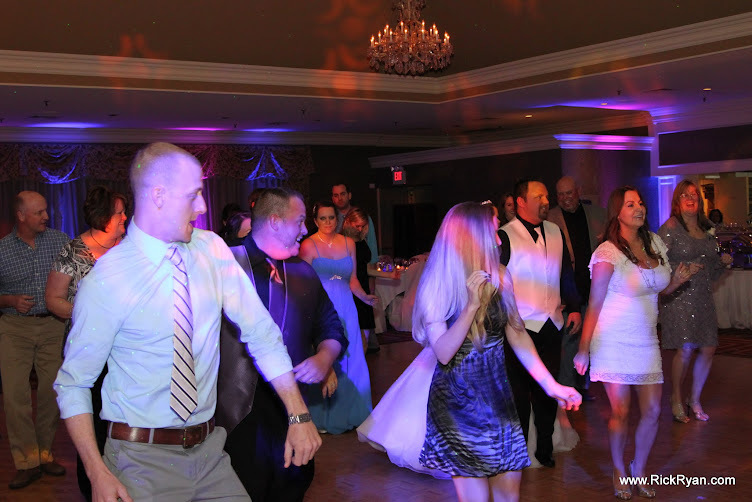 Our team of DJs and support personnel provide the ultimate in DJ, Emcee, Lighting and PhotoCenter service for many of the area’s most discerning clients. What a wonderful couple! Meet Liz & Ryan as they get down with some of their friends. They are an absolutely delightful couple and they certainly did a great job on putting together a stellar event. Their event was held at the Nashville Cathedral of the Incarnation, right down by Vanderbilt. This is a choice venue and we always love working there. For lighting, Liz asked for a "peachy but not too pink". The Cathedral has these lovely old (and yellow) stained glass windows, which change the tint a bit while sunlight is still streaming. Over the head table, we placed a large monogram of their last name and date. It seemed to be a hit with a lot of folks. The evening was filled with a lot of fun, dancing and elegance and finished off with one of the sweetest final dances I can remember. Enchanted Florist (http://enchantedfloristtn.com/) Caprice, you're a monster, as always! We wish the happy couple many, many wonderful years together! Thanks for letting us be a part! 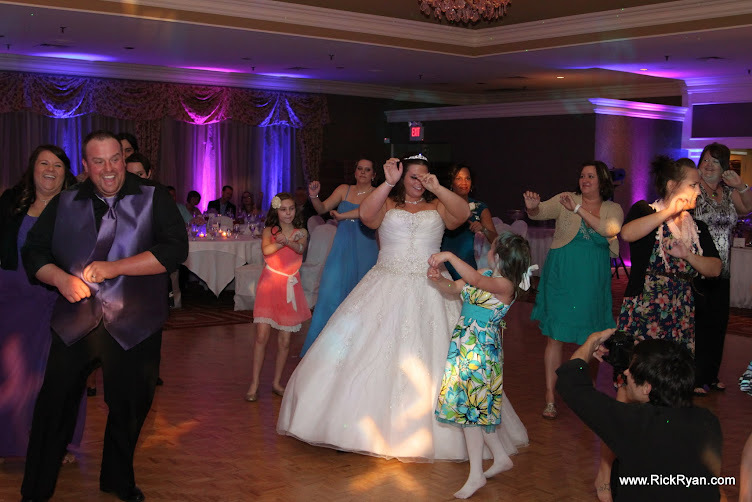 Meet Meghan & Robert as they enjoy their First Dance together. Both of them are teachers and wow, do they know how to throw a great party! 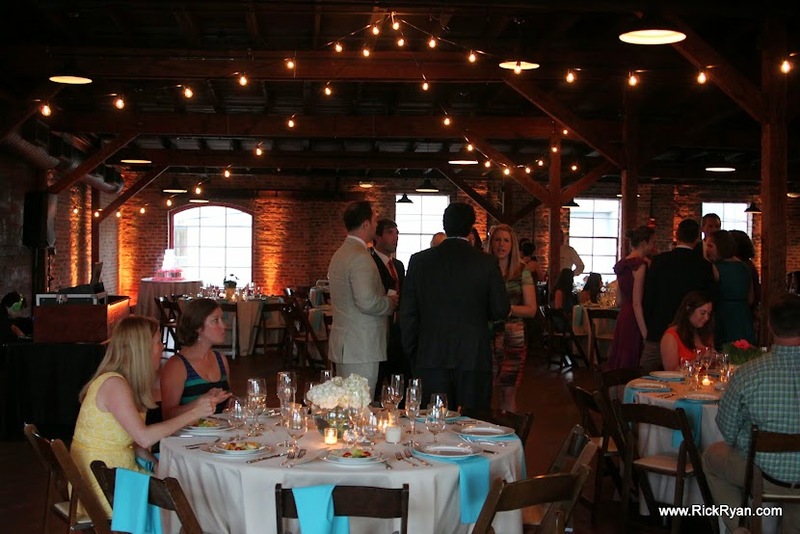 Their event was held at the el-chique, Houston Station, which is a lovely old converted warehouse space near downtown Nashville. This event had a few special items on lighting so let me share a few of those. Over the dance floor, we installed Italian String Lighting, then hit the floor with an Amber, patterned leko light as well as the couple's monogram. Around the perimeter, we also installed LED uplights with a rich, Amber tone to it. Here are a few pictures. Seeing that there's a nice, long entry hallway, we used a combination of another Amber Leko light (same gobo pattern), Amber LED uplights as well as some Blisslight star system lasers. It gave the entrance a magical feel to it, which the guests loved. Now enough about the boring techie stuff, let's get to the party (and boy, what a party it was)! From the minute we opened the dance floor, it was packed all night and these guys partied like rockstars! What a fantastic evening and to top it all off, the guests were given Tennessee and Yale pom-poms for a drive-by send off. Thanks for letting us be a part of your very special evening, guys. We wish you all the very best in life. Meet Zena & David during their First Dance. Their Wedding Reception was held at the Loews Vanderbilt Hotel in Nashville. This was an ultra-elegant affair, complete with monogram, uplighting and a PhotoCenter. 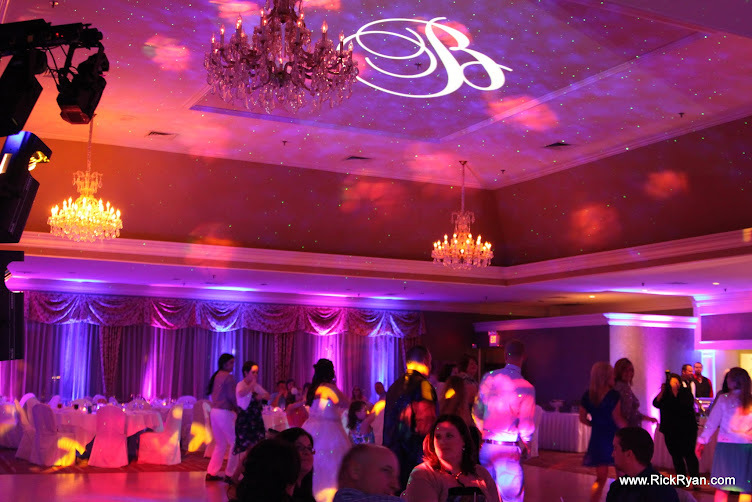 The pink uplighting blended perfectly with the elegance of the main ballroom. Check out the cake spotlighting. Zena & David live in Atlanta, moving there from Nashville. During our planning meeting, we had the pleasure to meet David's mother, who is from Chile. Seeing that a portion of the guests were from her home country, we also incorporated latina music, so they would feel at ease as well. The couple said their guests were going to be huge dancers and they certainly didn't fail to impress this DJ with some serious moves. The guests also had some huge fun at our PhotoCenter (special thanks to Angela, our PB technician). Thank you for allowing us to be a part of your very special celebration. PRESS RELEASE: Italian String Lighting now available! We're excited to announce that we now are offering Italian String Lighting for our clients' ultra-elegant events! For those who aren't familiar with it, let me share a photo from a recent event Houston Station in Nashville, TN. I know, "Oh you mean Christmas lights?" No, there's a huge difference. These are commercial-grade stringers, complete with 15-watt (not 5 or 7-watters) globe bulbs and dimmer circuits. These are incandescent bulbs that give off a soft, romantic light. They give that ultra-chique to practically any event, not to mention the soft glow that will set a wonderful ambiance for your event. Pricing may be found here. Given the logistics involved with this style of lighting, we require a site survey and venue permission, prior to booking. Please call us today to discuss how this great new product can benefit your very special day. 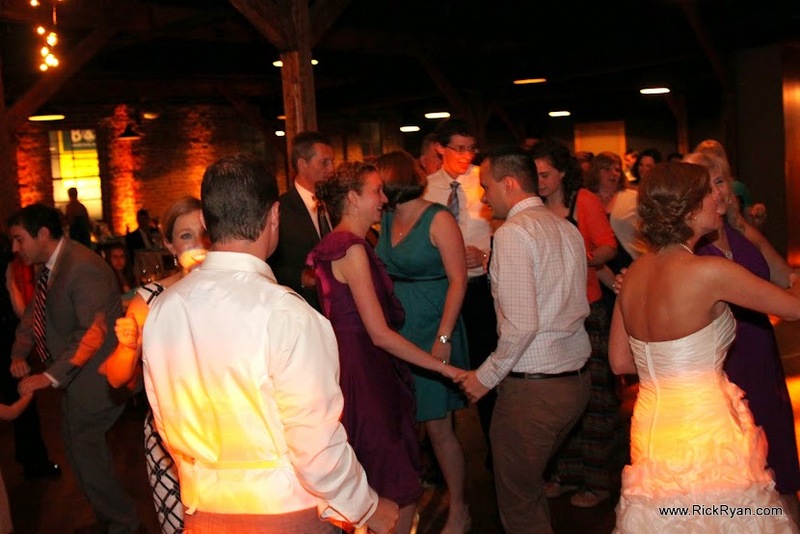 This is Megan and Patrick's wedding that I DJed this past weekend at The Hermitage (Andrew Jackson's home). The Ceremony was held in the Tulip Grove mansion followed by a cocktail hour. For the reception, the party of about 75 moved out to a 30'X60' tent. 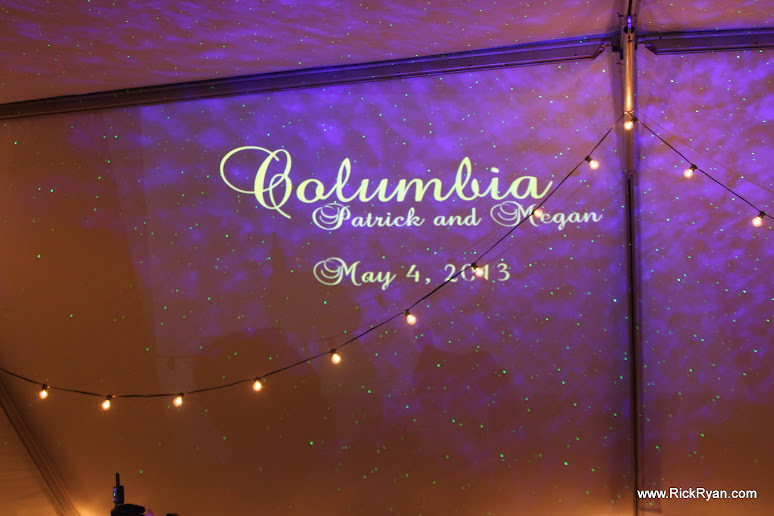 Our service was DJ, Dance Lighting, Uplighting (peach & mint), and monogram. The day was very wet and cold (mid-40s) but I was able to back the van, right up to the doorway to unload. Got everything in place and strung cables and installed the uplighting fixtures (20). I have to admit, I wasn't very crazy about what I might run into on this setup. It was cold and wet (something you don't want to deal with when running lights on the ground) and I knew we were working off a generator. 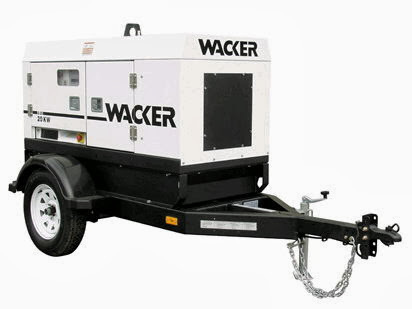 I was pleasantly surprised to find out the tent company had also supplied the generator and they did it right. 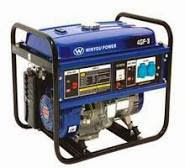 Big, industrial inverter-style generator with the distro box dropped right behind my table. In addition, the sidewalls had been properly pegged down (attaboy Patrick) and they actually had proper heating in the tent. Have to hand it to the B&G, they did the setup right. Great job guys. The Ceremony and cocktail hour were held in the Tulip Grove mansion. Nice place with lots of character to it. A bit later, the guests made their way out to the tent for the Wedding Reception. For the Father-Daughter dance, Megan asked us to do a mash-up. Start with a slow piece, then break into about 8 different songs and ending up with the full-length version of Quad City DJ's "Come On Ride The Train". This isn't what I'd normally use to transition into open dance but it worked perfectly. As the last song started, we invited the guests to "Get on board" and boy, did they ever! This was the perfect start to a high-energy dance set. A shot of the monogram, projected to the tent ceiling. The evening ended with all-smiles by our happy couple. Congratulations Megan and Patrick. We wish you both all the happiness in the world. Special thanks go out to our great friends at B&B Portraits and Two Fat Men Catering (I need the recipe on that potato chip chicken, WOW!). Fantastic job, guys! 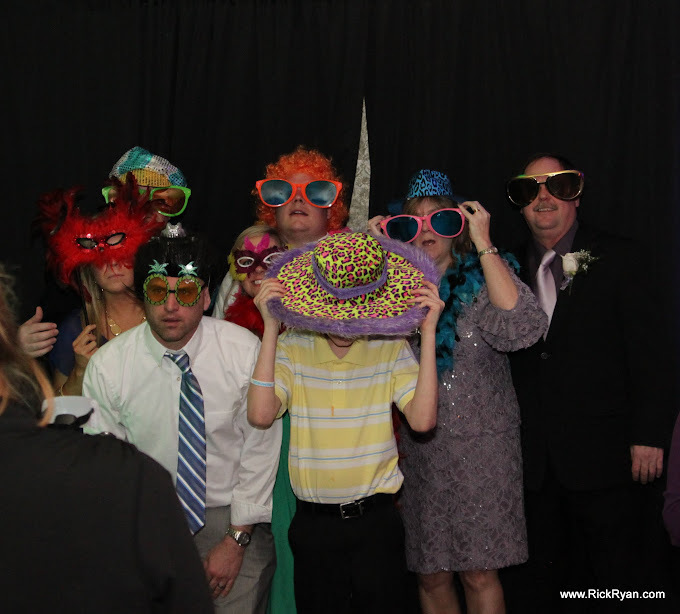 This is Daniel's Big Bar Mitzvah held this past weekend at Old Natchez Country Club in Franklin, TN. This was a huge event with energy that was absolutely off the charts! About 100 kids an 50-75 adults in attendance. 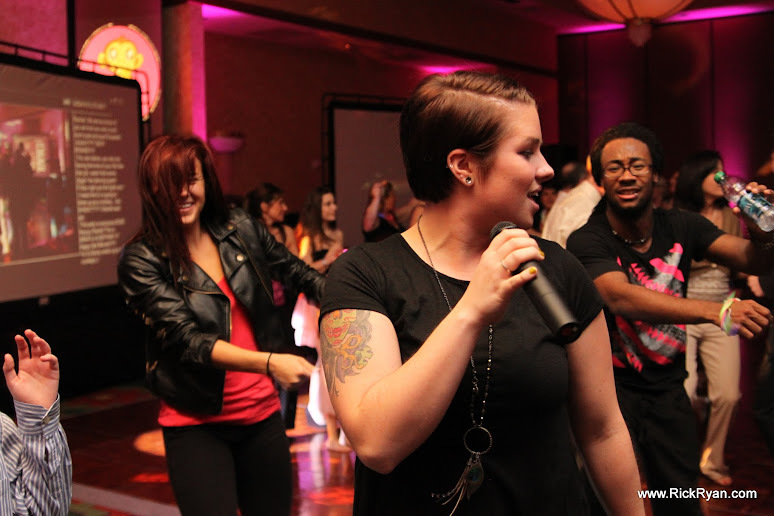 Our crew included a 7-person team; 2 DJ/Emcees, 2 professional dancers, 2 A/V techs and 1 PhotoCenter technician. The package included our huge, dual video screens (which barely fit in the room, btw); Live-Pics/Texting on the left and Shadow-dancing on the right. DJ Russ started the evening off with a series of fun games and the kids quickly got into "party mode". Our dance team, Shay and Malik helped us with the kids as well as a new friend, Angela. Thanks guys, for such a great job! As the evening progressed and daylight subsided, the bright and bold uplighting colors really began showing. 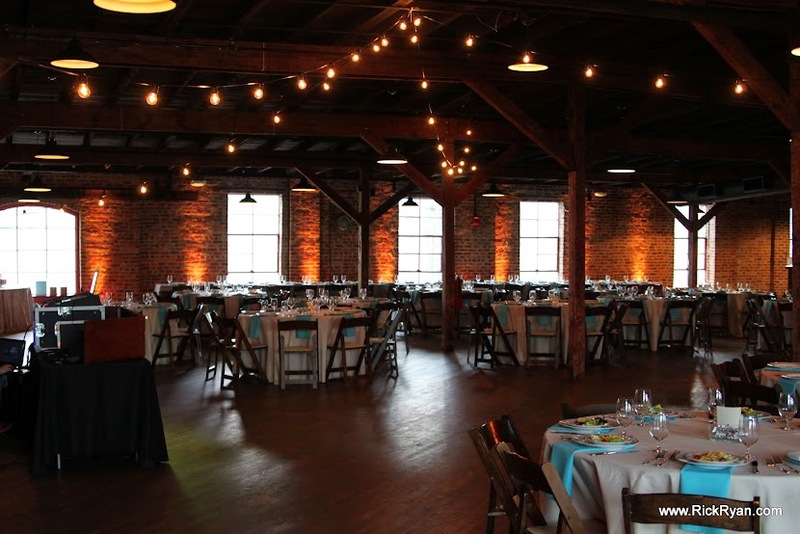 We used about 30 fixtures, which were strewn through several different rooms around the venue and we used a color scheme of Blue, Orange and Yellow, which matched up with Daniel's chosen theme and table center-pieces (Blue/Orange/Yellow Lacrosse balls). The PhotoCenter was also a huge hit and we look forward to seeing the PictureBook from it. Following are some pictures from the event. Meet Lauren and Philip (as he gets her garter). One of the absolute sweetest couples you'll ever hope to meet and they were an absolute joy to work with on their wedding. The event, both Ceremony and Reception, was held at Old Natchez Country Club in Franklin, TN. This was my first time to work at Old Natchez. Very nice club and the staff there are superb and hosted a flawless event. 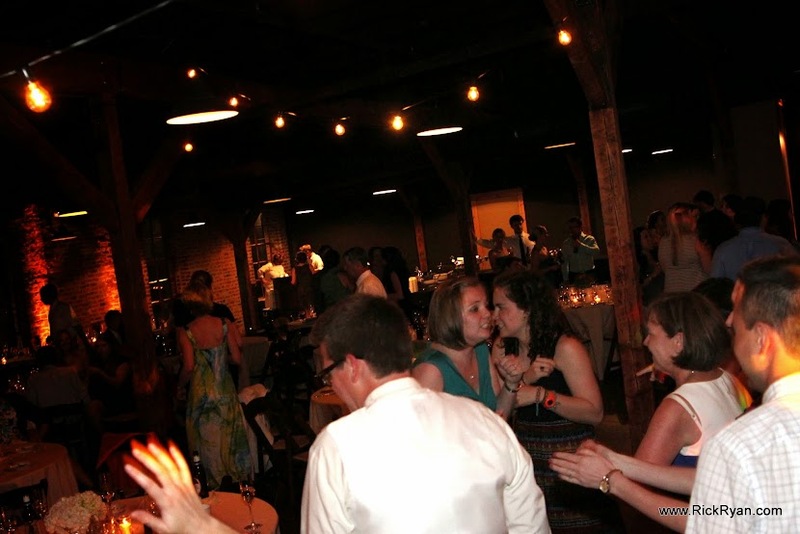 There are separate areas for dance, dinner and cocktails, yet all three areas are adjoined together. The rear veranda opens up to some fantastic scenery, overlooking the golf course. To finish off a perfect evening, our lucky couple departed to a sparkler exit. This week finds us at the beautiful Bluegrass Country Club in Hendersonville for both the Ceremony and Reception of Amanda and Stephen. The Ceremony was held in the back "Glass Room", which overlooks the golf course, while the Reception was held in the Grand Ballroom. Patti Corn is the Private Events Director at this venue and she always does a fabulous job on whatever kind of event she's producing and this one was no exception. For those who have never been to Bluegrass, it is one of Nashville's premiere establishments, with one of the best kitchens in town. Their food is to die for and the surroundings are ultra-elegant. Our lucky couple chose a two-color Uplighting theme and we ended up installing close to 40 LED fixtures; both along the wall space and behind the sheer curtains that face the front of the building. 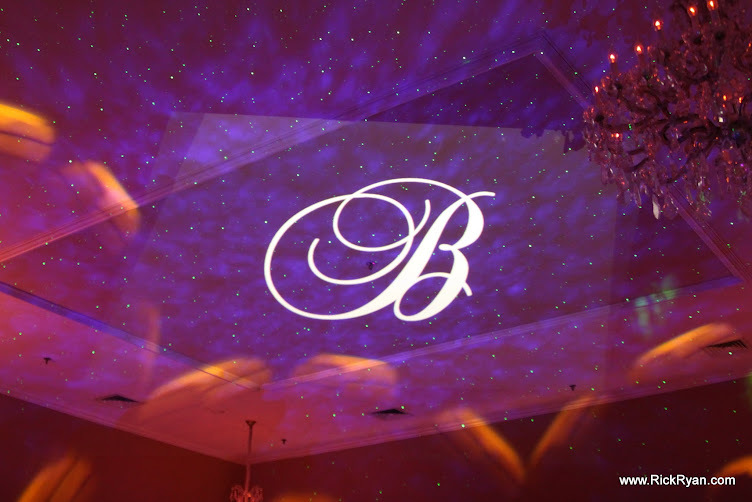 For Monogram, Amanda chose a simple "B" in Brock Script, which we placed on the ceiling above the dance floor. We used the Blisslight Star System lasers to highlight the monogram. 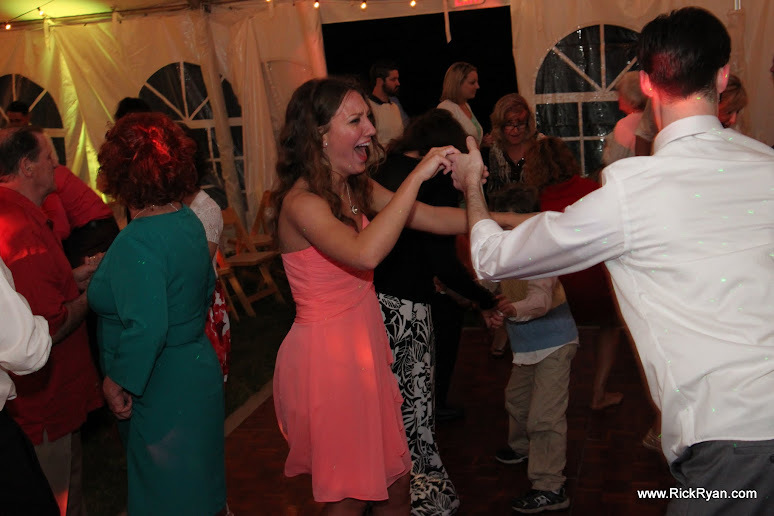 Our guests had a great time with lots of dance floor action. The PhotoCenter was a huge success with everything from singles to some rather huge group shots. The props went over huge! "Thank You!" to Amanda and Stephen. We wish you both all the very best in life together. 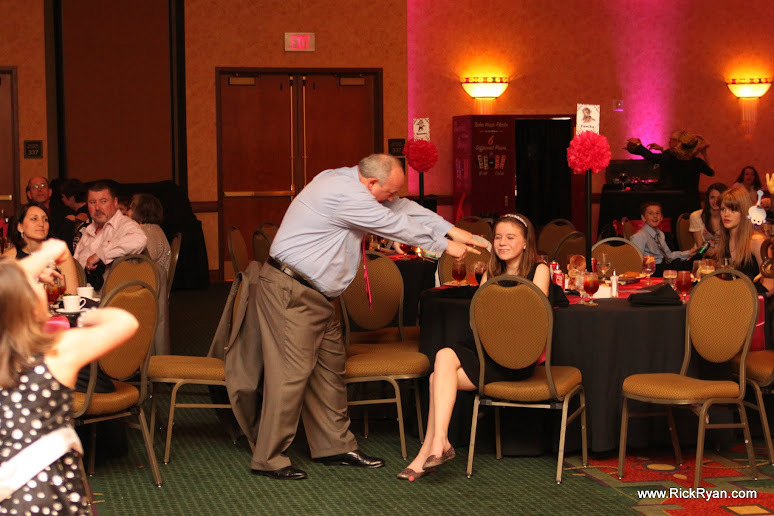 This week finds us at Embassy Suites Hotel in Coolsprings for Rachel's Bat Mitzvah. The event was held at the Embassy Suite Hotel in Cool Springs and this is a gorgeous facility. Since Rachel just adores monkeys, this was our evening's theme complete with a Monkey Ice Sculpture and tons of monkey-themed prizes for the kids. Here's DJ Russ, striking a pose in front of the sculpture. 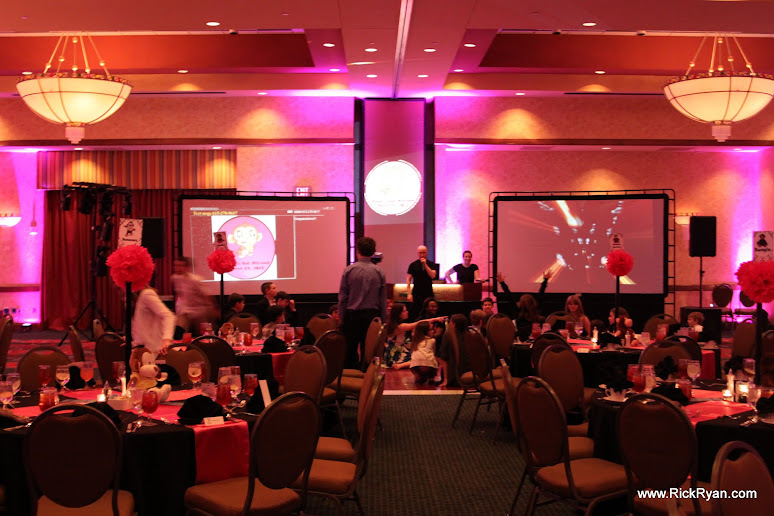 This is one of our largest setups, complete with two, 10-foot rear projection screens on either side of the DJ table. The left side was our patented Live-Pics (r) and Text-messaging system. The right screen was setup for some fun shadow-dancing. While the adults enjoyed themselves at a Cocktail hour in the Atrium, DJ Russ and our dancers, Shay and Malik, kept the kids entertained with a series of great games. As the night moved along, even the adults joined us on the packed dance floor for some great dancing. And, as if that weren't enough, we also had a very special musical guest when Jordan Meredith (of American Idol fame) took the mic to belt out some serious Aretha Franklin stuff. Meet Rachel and Austin as they made their Grand Entrance. We always love working with members of our Armed Forces and Austin is a Second Lieutenant. They were given a full Sabre entrance. For those who haven't seen this type of entrance before, it's really unique. First, the soldiers use their sabres to form an archway for the Bride & Groom. As the couple reaches the last pair of soldiers, they lower their sabres in order to stop the happy couple and encourage them to kiss (as in the shot above). As soon as they kiss, the sabres are raised, allowing the lucky couple of pass through. As the bride passes the last pair of soldiers, one of them give her a little "swat"
DJ Ed and Shannon handled day-of duties on this event and it was a great party. Our service included Amber Uplighting and it set off the room beautifully. 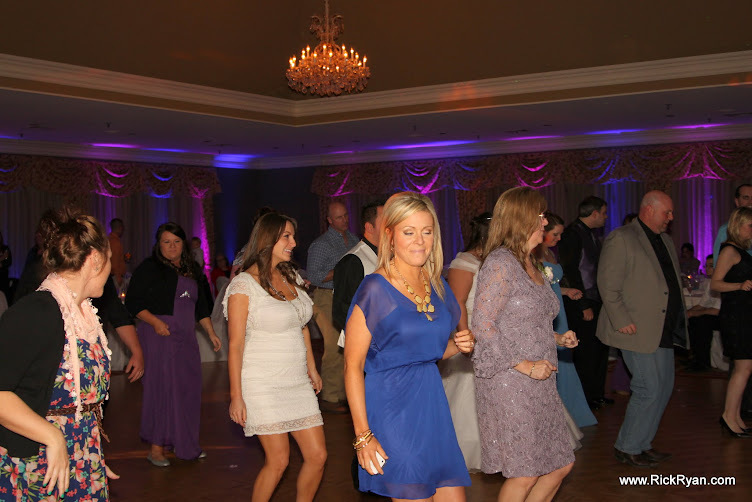 As the night went on, the guests had themselves a very good time on the dance floor. 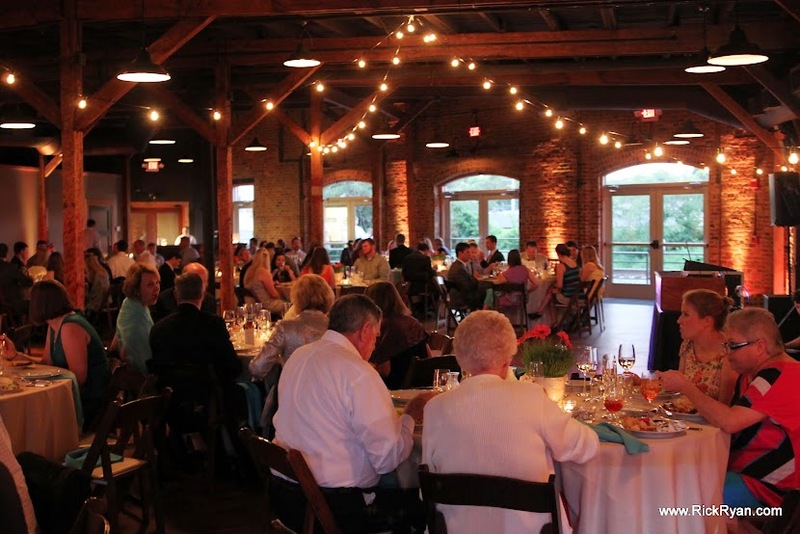 If you're looking for a great venue, try Stones River. Becca George is Special Events Manager and I highly, HIGHLY recommend her services. She always goes the extra mile to make certain that every detail is absolute perfection. We'd also like to give a shout-out to our good friends over at Myrick Studios. Myrick Cowart is one of the most talented and highly-rated photographers in the Nashville market. It's always a pleasure to get to work with such top-rated pros. This was one of our larger lighting setups, and included over 30 perimeter Uplighting fixtures (green & purple), 4 mirror scanners, 2 Martin acrobats, and followspot for the Grand Entrance. For visuals, we ran 2 ten foot screens on either side of the stage. On the left, we ran Live-Pics (our live picture slideshow) and Text messaging. On the right we ran another ten foot screen for shadow-dancing (projector in the back and we let the kids dance in front of the screen-very cool). Our Motivational Dancers, Shay and Malik also had their hands full, engaging the kids (and adults) and even led a group dance-off during the night. I have to give props to Shay. Earlier in the evening, she was on the floor and working with the kids when one young man got a bit excited, swinging his coat over his head. It just so happened that a button from his coat caught Shay right in the eye (major ouch) and it started swelling shut immediately! Instead of packing it in, Malik got a bag of ice and Shay used it to take the swelling down, then headed back out onto the floor for more action the rest of the evening. The PhotoCenter was also a huge hit and Shannon stayed busy the entire night running over 185 sessions (560+ individual shots) for the night. This was probably the most shots we've ever squeezed into a single event and Shannon handled it like a pro. Props to her for doing such a great job. The rest of the evening was spent with dancing and tons of prizes and cool glow-wear. Ruby has several sisters, which showed us their wild-and-crazy side. Check out the fun at the PhotoCenter. After a fantastic meal, provided by HGC (these guys have one of the best kept secrets with their chef, by the way), we kicked it up a notch and let our guests "cut a rug". Toward the end of the night, both Ruby & Henry got up to exchange gifts. One of the gifts was a trip to Disney World, which they and several family members were leaving for the next morning. I just loved the Mouseketeer hats. Thanks guys, for letting us be a part of your celebration!